Kite speaks up. "spar against me little man. I can handle it if you want to test your weapon." "Oh neat, I get to see how you two fight? I second the tall guy's notion in that case," Cas chimes in, giving a thumbs-up to Kite. Getting to see how her allies perform in battle without actually having to be in a real battle herself? 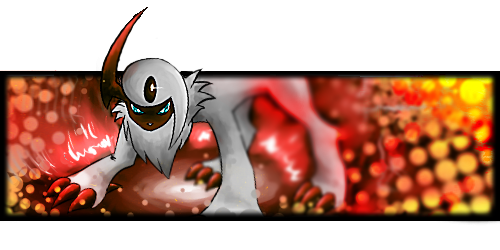 The Absol liked the sound of that. "... After we get our food, of course. I know a pretty good noodle place nearby." "Yes, I agree." Maka replies happily. "Let's all get a nice meal, THEN I'll spar with Mister Kite." Anyone else vote to skip the Noodle Incident (literally in this case) and get to the hopefully actiony pretend-fight-thing? "I'd like to watch too. Gonna be rooting for you, Maka." Cia says, smiling. "We'll do it on our beach trip. I like fighting in the sand." "Right, we should probably actually head inside..." Cas agrees, leading the way into the aforementioned restaurant. Cia slowly steps in, looking around warily. She really didn't like people. ._. "Cia, don't worry about them." Abella calls up to the Noivern, who slowly nods. Maka steps in past them, taking a quick glance around, before hopping onto a waiting bench nearby. There's a click as Kite fits his guantlets onto his wrist. "Place smells good. Smells like curry...oh my god it is curry!" He yells rushing over to the counter. "Whoa hey save some for the rest of us Kite"
Cas can't help but laugh at this. "Remember, you're paying for us." she mentions to Serena, getting into line with an amused-looking grin. "I know." Serena shakes her head getting her own food and sitting down.